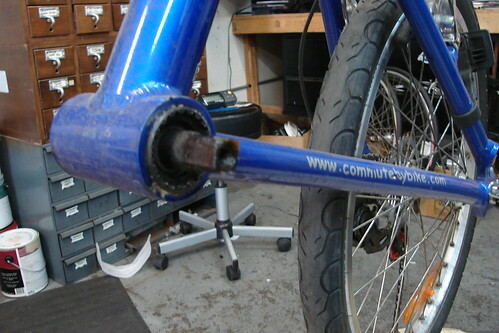 A while ago I started to notice that the bottom bracket was loose. So I decided to try and loosen it first then tighten it. However, I noticed that the bottom bracket shell had red Loctite coming out of it. 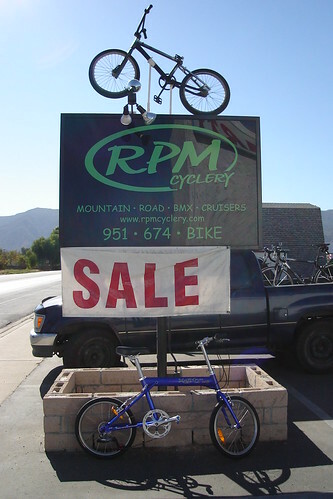 I even took the bike to RPM Cyclery to see if they could do anything about it. Scott and I tried to break loose the bottom bracket but only to bust one of his BB tools. 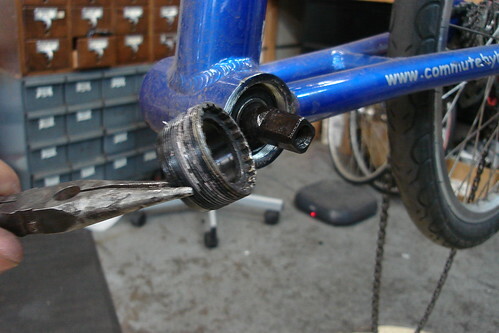 Scott recommended we torch the bottom bracket shell to melt away the Loctite. I emailed Xootr to find out if this method would be ok on the frame. Once we got the “OK” from them, Scott and I went to work. 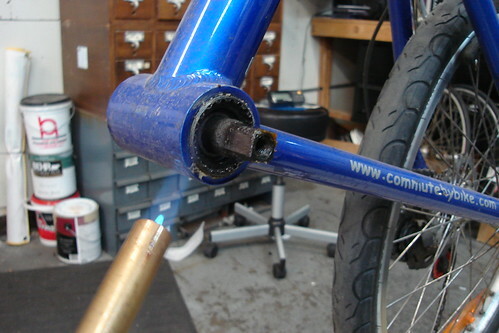 Then we start torching the bottom bracket. After heating it up for about 15 minutes, the cup slowly came out. You can see the Loctite through out the threads. The drive train side was next. 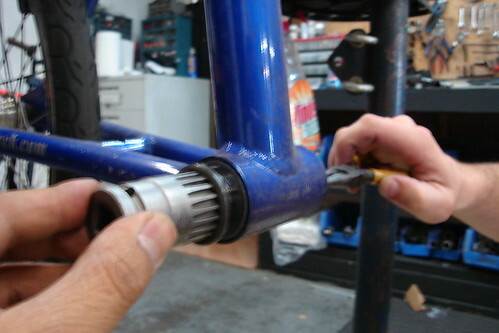 After letting the frame cool off, we cleaned out the Loctite with some solvent and applied assembly grease on the new bottom bracket and reinstalled the crank set. Here’s the Xootr after it was fixed, ready to be ridden. After we fixed it, I dropped off the the Xootr at FedEx to ship to NYC to get a make over from Nick James. I’m kinda curious to see what kind of Urbanization the Xootr will go through. I’d like to say thanks to Scott Finch of RPM Cyclery for providing the guidance and help in fixing this issue. I’m gonna raise the seat and mount a laser rifle to the handlebars! Actually, my plan is to turn the bike into a folding fixed-gear, so that I can travel with a bike that I like. I’d also like to set it up for bad weather, since my IRO is not the ideal candidate for fenders or wider tires. In any case, changes will be made! Remove the wheels and place the frame (drive side facing you) on a non-slip surface (carpet) up against a wall for support. With your left foot on the chainstays, hold the socket head (I’m using a Nashbar BB socket) firmly in place with your left hand, and push down on the breaker bar with your right hand clockwise (yes, we’re removing the drive-side first). Lean into the breaker bar and you should hear a crack as the bottom bracket gives way. Once the drive side is loose, go at it with the non-drive side, only this time, pulling up on the breaker bar while resisting with downward pressure on the chain stays with your left foot. I once had to tackle a rusted/seized BB. I used a 350lb/ft air gun on the non-drive side. No go. After nearly ripping the lockring teeth to shreds with the airgun, I decided to have a go at the drive side. Bingo. Once the drive-side came out, the non-drive side was less reluctant. Doesn’t torching the frame significantly weaken the 6061-T6 heat-treated aluminum?